Remain in Motion Mod provides players the abilities to move blocks, and expands the possibilities of Minecraft vastly. The original developer, JAKJ, is now being maintained and expanded since it seems to be inactive. Carriage frameworks are the base item for crafting carriage blocks. The screwdriver is the tool used to manipulate carriages and carriage drives. It does not take damage when it is used, so it will last forever. It is used for opening and closing the sides of carriages, and for turning on and off the continuous mode of carriage drives. You can open/close the carriage side opposite the one you are actually using the screwdriver on, if you are sneaking while you use the screwdriver. This is useful when you place a carriage against another block, and can’t get to that side to use the screwdriver on it. Frame carriages act just like the Redpower frames used to: They will connect to any block that is directly touching one of their sides, and nothing else. This allows for precise control of exactly what is picked up and moved. To prevent a frame carriage from trying to pick up blocks on a particular side, use the screwdriver to close that side. Platform carriages act like frame carriages, except they pick up not only what is directly touching them, but also anything that is touching those blocks, and anything touching those blocks, et cetera, until it reaches empty air (or it finds more than 5000 blocks to move, which is its maximum, to prevent trying accidentally to move an entire continent). To prevent a platform carriage from trying to pick up blocks directly or indirectly connected to a particular side, use the screwdriver to close that side. Structure carriages are rather special: If you place them in a cuboid wireframe (eight corners and twelve edges) around anything, they will pick up the entire structure inside that cuboid region and move it. Effectively, this lets you move your entire house elsewhere. For the structure carriage to function properly, all sides of all carriage blocks must be closed except for the sides touching other structure carriages. To make this easier, using the screwdriver on the side of a structure carriage will properly configure the sides of the structure carriages in a straight line out from the one you used the screwdriver on. That means you need to use the screwdriver only twelve times to configure a structure carriage. Support carriages are also a bit special: They can be only one layer thick, and they can all have only one side open at a time which for the entire support carriage must all be the same side. In the direction of the open sides, the support carriage will support the entire structure it finds, all the way out to air (just like a platform carriage), except it is limited to the spaces in a straight line from any support carriage. This means if it’s against a wall, it won’t try to pick up that wall, even if blocks on the support carriage are touching that wall. Using the screwdriver will change which side is the open side, but they must be done one-at-a-time. Template carriages are another special type of carriage: These let you lay out a block-by-block pattern with surgical precision, and thereafter will move those block positions (relative to itself), and only those block positions, never connecting to anything you don’t intend to move. Place down template carriages in the shape you want to have blocks move, and place down a template carriage to serve as the anchor for future movement. (The entire assemblage must be contiguous to be recognized.) Use the screwdriver on the anchor block, and it will absorb all the other contiguous template carriages into itself, and its sides will close (showing its decoration if you have applied any). Now, just move the patterned template carriage block with any carriage drive, and watch the magic happen. If you break a patterned template carriage, it will lose its pattern, so all patterns must be assembled in-place; The only safe way to move a patterened template carriage is via a carriage drive. Carriages of any type can be decorated/disguised to look like other blocks without otherwise affecting their function, in order to make carriages look prettier. Only closed sides of carriages will display with their decoration; Open sides will continue to use the normal texture for that carriage type. Any block of any kind (including blocks from any mod) can be used in this recipe, as long as the block doesn’t rely on special rendering or embedded information for its appearance. Note that this recipe will work even for blocks that don’t make any sense, such as torches, so be sure to experiment with your desired decoration before throwing away an entire stack of it. If you wish to change the decoration, just put it back in the crafting grid with the new decoration: You do not need to remove the decoration first. Decorations are removed simply by putting the decorated carriage block on its own in any crafting grid. Carriage motors are like the old Redpower frame engines, except they don’t require any sort of fuel. Apply a direct redstone signal to the motor in any direction, and it will grab the entire carriage structure (determined by which type of carriage block was used) and move it one block in the direction opposite the direction of the redstone signal. So, if you want to move a carriage up, apply a signal from below, and if you want to move a carriage north, apply a signal from the south. Carriage motors cannot handle more than one signal at a time, nor more than one frame at a time: Only one signal and one carriage may be touching any of the six sides of the motor in order for it to activate. Movement takes one full second at normal speed: If you are experiencing lag of any kind (local or remote), it will take longer. During motion, all nearby entities (such as players, animals, monsters, ender crystals, minecarts, and loose items dropped on the ground) will be locked to the carriage and move along with it. If the chunk unloads and is reloaded, if the world is closed and reopened, or if the server shuts down and reboots, the entities will no longer be carried by the carriage, so you should not have something like a mobile chicken farm with an engine in continuous mode and no supervision. You can change which types of entities are grabbed by editing the config file. In normal mode, the motor will move the carriage one block, then wait for the redstone signal to be removed and reapplied. In continuous mode, the motor will keep moving the carriage block-by-block for as long as it is able, without any pause between, as long as the redstone signal is being steadily applied. Carriage motors cannot push carriages away from them or pull them towards themselves: Motors can move carriages only parallel to the side of the motor to which they are attached. Carriage engines are exactly like carriage motors, except they can move in all six directions, and they move with the carriage instead of staying put. Be careful! If you are standing on a carriage with a carriage engine in continuous mode, and you activate that engine, you will not be able to escape the carriage’s grasp and you will not be able to stop the carriage’s motion until it reaches the top of the sky or hits an obstruction. If you close the world and reopen it, or you log off the server and log back on, you will be free of the carriage’s motion. You can also try to disable the continuous mode of the carriage’s drive in-between motions; By default, you have 1/4 of one second of delay between motions in which to act. Carriage engines make it super-easy to create airborne contraptions, like the famous UFO of Direwolf20. You can have more than one engine to make it easier (so you aren’t trying to signal all six sides of an engine alternately): Try having one engine for N/S/E/W movement, and one for U/D, or whatever configuration suits you best. Remember: Continuous mode is dangerous while standing on engine-driven carriages! For directions, 0 is down, 1 is up, 2 is north (-Z), 3 is south (+Z), 4 is west (-X), and 5 is east (+X). For the simulation flag,true is simulate (don’t actually move anything) and false is don’t simulate (actually move the carriage). For the anchoring flag, true is the controller will stay where it is, and false is move the controller with the carriage. If the command is not issued with correct syntax, or if the carriage is somehow obstructed or malformed, an error will be printed; If the carriage is not configured properly, the return code will be “false” and a plain-English error message; If the carriage is obstructed, the return code will be “false”, a plain-English error message, and the X/Y/Z coordinates of the obstruction; Otherwise, the return code will be “true”. If you want wireless control of the carriage, you will need to connect a computer with wireless support to the carriage controller and interface with the network in that way: The carriage controller does not natively interact with the network, acting only as a peripheral. In addition, if the controller is instructed to move with the carriage, the computer will not be able to command it again without also being moved, so in that case, the computer would need to be connected to the carriage (and have an appropriate “startup” program that will re-connect with the controller). Translocators: These teleport carriages. Place two with the same label in the world, and connect a carriage. Craft with up to 8 dyes to change the label, and/or a comparator to label it with your username. 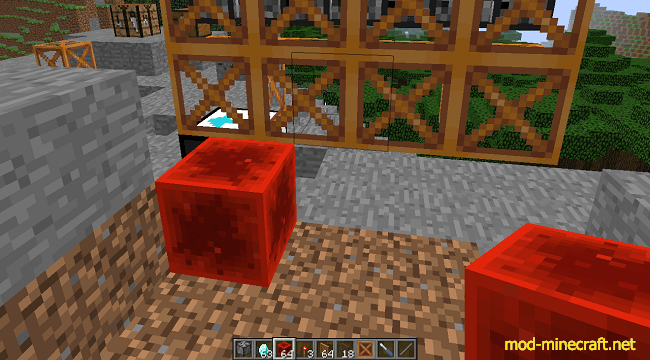 Apply a redstone signal to the translocator with the carriage to teleport the carriage. Teleportation moves the carriage from the translocator it is next to to a matching-labelled carriage that has space for it.